People take part in a rally in front of the Jacob K. Javits Federal Office Building denouncing the targeting of immigrant activists by Immigration Customs Enforcement while New York Police Department officers stand guard, New York, Jan. 27, 2018. U.S. lawmakers are struggling to find common ground on one of the nation’s toughest political debates and a key issue that led to the most recent government shutdown: immigration policy. President Donald Trump told Congress it is time to take U.S. immigration policy into the 21st century during his first State of the Union address on Tuesday. But his plan to provide funding for border security and secure a path to citizenship for 1.8 million undocumented immigrants is drawing criticism from both Republicans and Democrats. The chances that Trump can bring both sides together are dwindling, and failure to do so means Congress could face another government shutdown or be forced to pass another short-term funding bill to buy more time to help the so-called Dreamers — young undocumented immigrants brought to the U.S. as children. 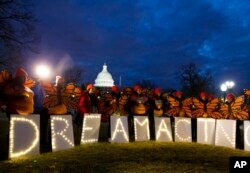 Trump rescinded the Obama-era Deferred Action for Childhood Arrivals (DACA) program affecting about 800,000 Dreamers last year and gave Congress until March 5 to pass legislation to provide similar protections. The U.S. Congress is considering a short-term measure to extend government funding beyond Feb. 9, giving them more time to come up with a solution for DACA recipients. As the deadline approaches, Democrats and Republicans remain deeply divided on key issues, and both sides object to parts of the immigration framework the White House has put forth. The Trump administration’s plan includes four pillars: a pathway to citizenship for Dreamers; funding for border security, including money to build portions of a wall; an end to family-based immigration and an end to the diversity visa lottery system. “My duty, and the sacred duty of every elected official in this chamber, is to defend Americans, to protect their safety, their families, their communities, and their right to the American Dream. Because Americans are dreamers, too,” Trump said during his nationally televised speech. Democrats pushed back in their response to Trump’s address, saying they would stand by Dreamers. 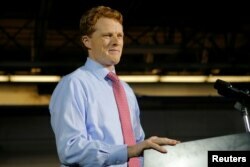 U.S. Rep. Joe Kennedy III (D-MA) takes the stage to deliver the Democratic rebuttal to U.S. President Donald Trump's State of the Union address in Fall River, Massachusetts, Jan. 30, 2018. “To all the Dreamers watching tonight, let me be clear: You are a part of our story. We will fight for you. We will not walk away,” Rep. Joe Kennedy said in English and in Spanish. But conservative members of Trump’s own party are criticizing his proposal to provide Dreamers with a pathway to citizenship. King is part of a conservative group of lawmakers who stand apart from more moderate Republicans who want to see a fix for DACA recipients. But it appears the Democrats’ greatest objection to the White House plan is over Trump’s proposal to cut the diversity visa lottery and family-based immigration programs. The Trump administration argues the systems are outmoded and leave the nation vulnerable to terrorist infiltration. Democratic lawmakers argue the programs reflect American values. “The United States became the strongest and most powerful nation on Earth with these immigration policies in place. And part of the reason why you allow people to petition to have their family members with them is because those family members being close to them makes it more likely that they’re going to succeed and less likely that they’re actually going to rely on the government for help.” Rep. Joaquin Castro told VOA on Tuesday. Sen. Jeff Flake, R-Ariz., who announced last year he would not run for re-election in 2018, takes questions from reporters at the Capitol in Washington, Jan. 4, 2018. Some moderate Republicans expressed potential for compromise. “Border security is going to need to be there. 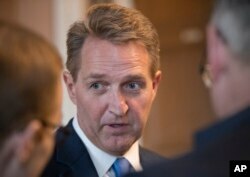 If you go diversity visa, get rid of that, if you talk about chain migration, those broaden the discussion and make it more difficult to get a deal,” Flake added. Democrats will fight their biggest battles on these fronts, not on the president’s border wall, which he once claimed would be paid for by Mexico. “Mexico is not going to pay for the wall, let’s be direct about that. So the taxpayers of this country are going to pay for border security and they’re going to be anxious to make sure that we spend our money wisely,” Sen. Ben Cardin, a Democrat from Maryland, told VOA. Both sides are accusing the other of unpredictability. “They talk a good game with DACA, but they don’t produce,” Trump told congressional Republicans at their annual retreat Thursday. He tweeted earlier Thursday that Democrats “Resist, Blame, Complain and Obstruct,” while time runs out for DACA recipients. But Democrats say Trump has proved to be an unreliable negotiator.